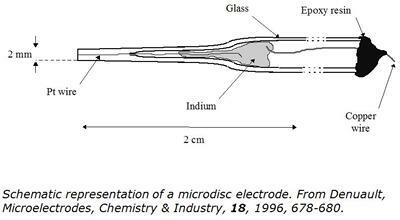 Microelectrodes have widened the applications of electroanalytical chemistry. Ranging from a few nanometres to a few micrometres, they improve the quality of experimental data and allow measurements in situations where conventional electrodes yield distorted responses. Our research is linked with the development of the SECM and of electrochemical sensors for environmental applications. We fabricate and characterise microelectrodes, perform electrochemical measurements in non-conventional systems, e.g. water with surfactants, develop new analytical techniques and fabricate the SECM probes. For example, in collaboration with Prof Daniele at the University of Venice, we have demonstrated that on microdisc electrodes the direct oxidation of hydroxide ions in aqueous solutions could be used for analytical purposes (Elsayed Abdelsalam et al., Voltammetry of hydroxide ion in aqueous solutions on gold microelectrodes. J. Electroanal. Chem., 449, 1998, 5-7). This opens up a range of studies and designs (e.g. sensors) previously not considered. We have harnessed the unique properties of microelectrodes to develop a microelectrode dissolved oxygen sensor for the measurement of deep sea oxygen profiles. Sosna, Oxygen Reduction at Microelectrodes: Application to the Dissolved Oxygen Sensor for in situ Oceanographic Measurements, PhD thesis, University of Southampton, Southampton, 2006. Sosna et al., Development of a reliable microelectrode dissolved oxygen sensor, Sensors and Actuators B, 123, 2007, 344-351. Sosna et al., Field assessment of a new membrane-free microelectrode dissolved oxygen sensor for water column profiling. Journal of Limnology and Oceanography: Methods, 6, 2008, 180–189.